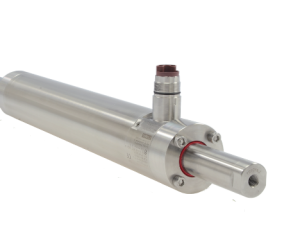 Linear motors with ATEX and IECEx certification are now available for use in hazardous locations and explosive atmospheres. These motors are required wherever flammable liquids, vapours, gases or flammable dust occur, for example in printing machines, plastic-processing machines and in the chemical or pharmaceutical industries. LinMot series P01-48 motors are now certified as EX-protected motors in accordance with Directive 94/9/EC as of October 2015. Device classifications 2G and 2D mean that the devices can be used in an explosive atmosphere consisting of gases, vapours, mist or dust. The motors are designed to be very compact and do not have unnecessary edges, corners, holes, and threaded connections. This avoids locations where explosive material can collect and minimises the risk of a potential ignition source due to uneven heating. Completely encapsulated in stainless steel, they do not need any seals. All joint connections are welded. To completely seal off the motor, the windings and other internal components of the stator are potted in epoxy resin. This guarantees optimal protection of the motor and eliminates the risk of electrical arcing. Please contact us to find out more or read the ATEX and IECEx linear motor datasheet from LinMot. More information about linear motors from LinMot can be found in our product pages.